Plain concrete slabs have served as the flooring material for basements, garages, patios, and utility areas for many years, but concrete is now also a viable material in modern homes, where it can be found in polished, etched, or stained form on the floors of any room in the house. As with all flooring materials, concrete has a variety of benefits that installers and salesmen will tout when trying to promote their product. However, there are also a number of drawbacks to using concrete in certain places. So before you strip out existing flooring and install bare or treated concrete, make sure you understand both the good and the bad. To people used to thinking of concrete as a utilitarian surface suitable only for driveways, garages, and sidewalks, the many virtues of concrete as a flooring material may come as a surprise. Durability: Concrete flooring is extremely tough and resilient and is able to withstand the pressure from very heavy equipment, such as cars, trucks, forklifts, and stacked crates. That is why it is such a popular material for hard-working commercial areas, such as garages and warehouses. Durability also means that the material is difficult to damage. High heels, furniture legs, and pet claws will not scratch the surface. You also don't have to worry about damage from most dropped items. While it is possible to chip or scratch a concrete surface, you will generally have to work pretty hard to do so. Easy maintenance: Keeping a concrete floor looking its best requires a minimum amount of maintenance. It will need to be sealed or waxed every 3 to 9 months, depending on the level of traffic, in order to maintain the protective layer over its surface. Other than that, you can use a neutral cleaning agent to mop the floor clean periodically. A blue utility pad can be used for particularly stubborn stains. Environmentally friendliness? In most cases, a concrete subfloor already exists beneath another flooring material in both on-grade and below-grade locations. That means that "installing" a concrete floor means just uninstalling whatever has been placed over it. Because no new material is produced, there is no carbon footprint or depletion of resources. Versatility: As long as the concrete is smooth and free from holes, bumps, and defects, you have the choice of installing any floor surface covering over it at a later date, should you choose—although may floor coverings will require an interim underlayment. Concrete floors allow you a lot of future design freedom. 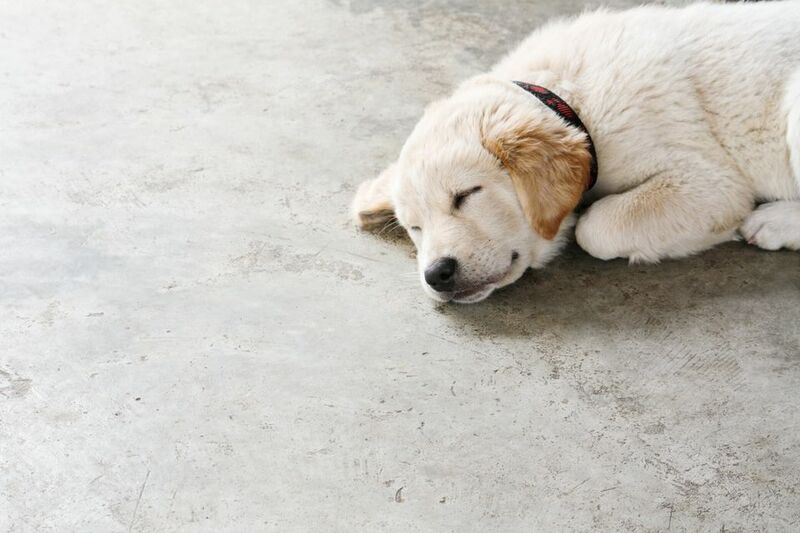 Long-lasting: A sealed and properly maintained concrete floor can last indefinitely. Even in commercial applications, concrete can survive under high-traffic conditions for many decades. Over the long run, this can save you a considerable amount of money and effort over replacing flooring every few years. Design flexibility: When most people think of concrete floors, they think of ugly gray utilitarian surfaces with sharp bumpy textures. However modern advances in mixing and setting have allowed designers to achieve an almost endless variety of color and texture effects with this versatile material. In some cases, coloration is mixed directly into the concrete before the slab is placed. For already-installed floors, you can acid-stain the surface, use an appropriate dye or staining agent, or paint over it with waterproof latex paint. The texture of the concrete can be made perfectly smooth during the installation process. Alternatively, decorative textural patterns can be molded into the surface while it is still setting. You also have the option of polishing the material to a smooth sheen or etching it to create a faux tile effect. Despite the many benefits, concrete is not the right flooring material for every house or for every room. Consider these drawbacks, as well, when choosing your flooring material. Hardness: The strength and durability of this material can also be a liability. The surface of a concrete floor is very hard—falling onto concrete will hurt and may seriously injure people. Items dropped on these surfaces are also likely to shatter or crack. That is why these floors are not recommended for areas which will be used by children or elderly people, or in kitchens were falling dishes are likely. Discomfort: The hardness of concrete also makes it uncomfortable to stand on for long periods of time. Concrete doesn't yield, and if you are forced to stand on it for an extended period, your feet and legs will pay the price. Coldness: Another drawback of concrete is that it has little insulating value. That means that on a cold winter morning the surface of the floor is going to feel chilled against bare toes unless it has been installed in conjunction with a radiant floor heating system. The inherent coldness of concrete can be offset to some extent through the use of carpets and throw rugs. Susceptibility to moisture: If not properly sealed on both top and bottom surfaces, concrete is easily penetrated by moisture, especially when installed over bare soil. The cool temperature of concrete can also cause moisture to condense in humid conditions. If liquid does manage to make its way into the pores of a concrete floor, it can lead to the growth of mold or mildew in your home. In some environments, you will also have to worry about the moisture freezing and expanding, cracking the floor. Slipperiness: When concrete is highly polished or buffed, or when coated with a gloss sealer, the surface can be very slippery, especially when wet. Concrete in bathrooms, kitchens, or entryways is especially susceptible to this. Environmental concerns: While using an already existing concrete slab as your floor surface uses no new materials, a new floor requires the manufacture of concrete, a process that requires a significant expenditure of energy and copious amounts of carbon dioxide. For environmentally conscious homeowners, a variety of green flooring options or eco-friendly brick might be better options than new concrete.